To analyse the administration of systemic glucocorticoids (SGC) to patients with Psoriatic arthritis (PsA). Online, anonymous, multiple-choice, closed-ended survey on SGC use in PsA, dose, duration of therapy, and the reason for administration. One hundred and twenty rheumatologists from Argentina (ARG) and 75 from other countries in Latin-America (LAT) completed the survey. Only 6% of the respondents indicated that they did not prescribe SGC, and 65% claimed that they administered them to less than 10% of their patients. Among those physicians who used SGC, 71% prescribed between 5 and 10 mg/day of prednisone, and only 5% over 10 mg/day. Seventy-three percent of the respondents administered SGC for less than 3 months, and 93% associated them with DMARDs, Biological Therapy (BT), or DMARDs plus BT. Clinical indications for SGC were (more than one option was possible): peripheral arthritis (79%), dactylitis (23%), enthesitis (20%), cutaneous involvement (11%), and axial involvement (8%). Thirty-four percent of ARG physicians versus 21% of LAT used SGC in over 10% of their patients (p 0.07) while 76.5% of ARG versus 59% of LAT administered doses higher than 5 mg/day of prednisone (p 0.01). SGC were indicated by most of the rheumatologists surveyed, but only to a reduced number of patients with PsA, at low doses, for short periods of time, associated with DMARDs/BT, and with the aim of treating peripheral joint manifestations. Argentinian physicians tended to prescribe SGC to more patients and at slightly higher doses. This study was presented as a poster in the 20th Pan-American League of Associations of Rheumatology Congress, that took place in Buenos Aires, Argentina in April 2018. 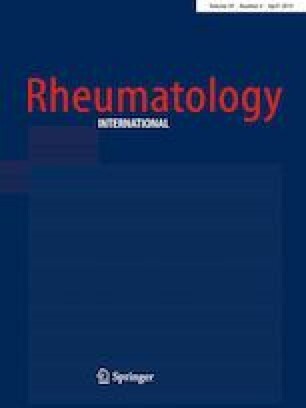 (https://journals.lww.com/jclinrheum/toc/2018/04001). The authors wish to thank Professor Ana Insausti for her cooperation in the translation of this research paper. Both, CA and VC took part in the conception and design of the study; VC and GS took part in the data management and analysis. All the authors write the article and approved the final manuscript.